BAAYUM! Habanero BBQ Rub is Super Hot and Super Sweet! 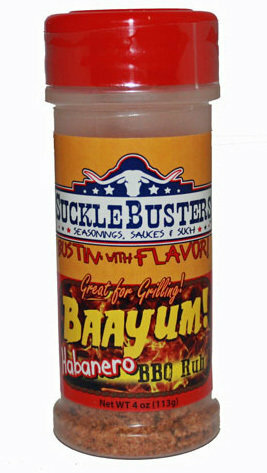 This is one of the the hottest BBQ Rubs in Texas because it has a Texas-sized helping of habanero powder. It is not for the faint of heart. It is HOT! And when we say HOT! We mean HOT! BAAYUM! The heat comes on slow, then builds and has a long-lasting quality from the habanero powder. If you like it Hot, then this awesomely hot and sweet BBQ Rub for you. BAAYUM! is great on anything - our favorites are chicken, pork and fish. Sprinkle it on and BAAYUM! You will feel the pain. All-Natural, NO MSG. Naturally Gluten Free. Ingredients: Sea Salt, Turbinado Sugar, Brown Sugar, Black Pepper, Chile Pepper, Habanero Powder, Spices & Silica. NO MSG. Naturally Gluten Free.